A ceremony to register and welcome new Australian citizens. Posted October 25, 2017 by Alec Smart & filed under Inner West Independent. New citizens may soon receive an invitation to be sworn in as Australian citizens during NAIDOC Week instead of Australia Day. Inner West Council will be the first council in NSW to initiate and hold a citizenship ceremony during NAIDOC Week, which is held in the first week of July each year. With the Inner West Council focused on efforts for reconciliation, it appears this may be a step in the right direction. Currently, under the Department of Immigration’s Australian Citizenship’s Ceremonies Code, Australia Day (January 26) and Australian Citizenship Day (September 17) are the only two ‘Special Event’ days listed. But councils are encouraged to host citizenship ceremonies every two to three months regardless of the number of candidates. Cr Byrne intends to write to all prospective new citizens offering the new ceremony as an alternative citizenship ceremony to Australia Day as well as providing an opportunity for everyone to recognise and celebrate the Aboriginal history of the local area. “I’ll invite them to be sworn in, if they choose, at a ceremony that will specifically and proudly celebrate the history, culture, achievements and resilience of Aboriginal and Islander people,” he said. The Inner West Council’s announcement has been met with mixed reactions from the public, with many discussions pitting NAIDOC Week against Australia Day. “NAIDOC Week is a time to acknowledge and celebrate aboriginal history, culture and achievements and the significant contribution that Aboriginal and Torres Strait Islander people make. If offering a citizenship ceremony as part of local NAIDOC Week celebrations is something that is supported by local Aboriginal elders and communities in the inner west then this is a welcome initiative – but it must not be used as a way to avoid dealing with the big issue,” said Jenny Leong, Greens MP for Newtown. 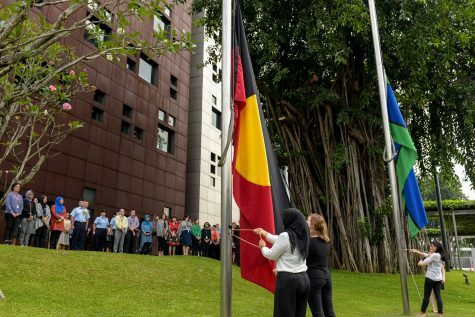 “This new ceremony can be a moving and respectful way to acknowledge the ongoing hurt and discrimination Indigenous people have suffered, as well as educating new citizens about the strengths of the world’s longest continual human civilisation, which has existed here for so many millennia,” said Mayor Darcy Byrne. But reports from The Department of Immigration and Border Protection do show that 38 councils across Australia have held citizenship ceremonies during NAIDOC Week in 2017- hardly a threat to the millions of Australians who still choose to celebrate on January 26. Mayor Darcy Byrne said Council will work closely to consult the local Aboriginal and Torres Strait Islander community when planning the ceremonies, and the Council has the support from The Department of Immigration and Border Protection. “The Department would be supportive of assisting local government councils to schedule citizenship ceremonies during NAIDOC Week, to help celebrate Aboriginal and Torres Strait Islander history, culture and achievements and as an opportunity to recognise the contributions that Indigenous Australians make to our country and our society,” said the spokesperson for the Department of Immigration and Border Protection. The Aboriginal and Torres Strait Islander Strategic Reference Group will be meeting on November 14 to discuss the proposal in further detail.